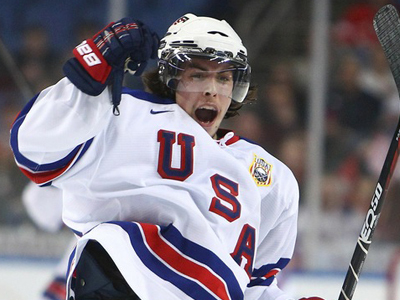 The Carolina Hurricanes 21 year-old defensemen, Justin Faulk, has been named to the United States Olympic team for the 2014 Winter Games in Sochi, Russia. The young man who comes from St. Paul, Minnesota was drafted to the Carolina Hurricanes in April of 2011 after helping win a national championship for the University of Minnesota Duluth. Faulk has been involved with international competition for the U.S. since he was only 16 years old. As a product of the United States National Team Development Program, he has already represented the U.S. on several occasions- the 2010 IIHF World U18 Championships, the 2011 World Junior Championships, and the 2012 and 2013 IIHF World Championships. Now, he will be representing the U.S. once again as a defenseman in the 2014 Winter Olympics. For the Canes, Faulk has totaled 53 points in 144 career NHL games. This season as a Carolina Hurricane, Faulk has three goals and 13 assists in 40 games and averages about 24 minutes of ice time per game. Faulk along with Andrej Sekera, have been the Canes’ top defense pair this season. Faulk has definitely been a favorite for the Canes this season. After being so involved with U.S. teams in the past, there’s definitely a lot of confidence in him doing well in the 2014 Winter Olympics.